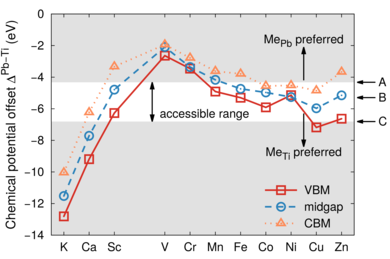 A systematic investigation of dopants in tetragonal lead titanate is presented by screening elements from the third period including K, Ca and all 3d transition metals. 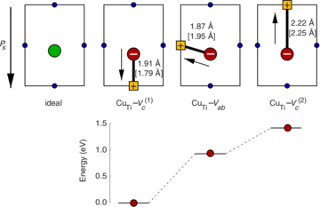 Formation energies and equilibrium transition states are determined by means of density functional theory calculations for both cation sites in the perovskite lattice, which allows us to discriminate between donor and acceptor type behavior. 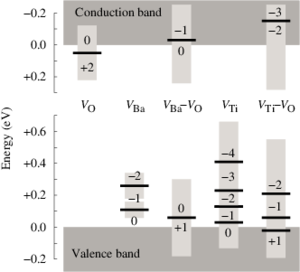 The stability of defect dipoles is determined by calculating the binding energy of transition metal-vacancy complexes. The results reveal that the tendency to substitute the Pb-site rather than the Ti-site monotonically increases going from Ti to Zn. The transition from Ti to Pb substitution depends both on the chemical equilibrium conditions and the position of the Fermi energy. This is most evident for Sc and Zn dopants that in principle can occupy both Pb- and Ti-sites depending on preparation conditions. Except for V all acceptor dopants form defect complexes with oxygen vacancies and thus can form defect dipoles causing hardening as well as aging effects. Defect dipoles involving Pb substitution and oxygen vacancies are found to be unfavorable for all dopants considered here.